A Battle is going on between Jalal Uddin Akbar and Maharana Pratap the two legends of history. They have their own battle rules. In battle always a wall of warrior is created. Jalal creates it as V shape and Pratap made a Straight wall of warrior. It as 3 points. First one is zero and other two are the A and B. 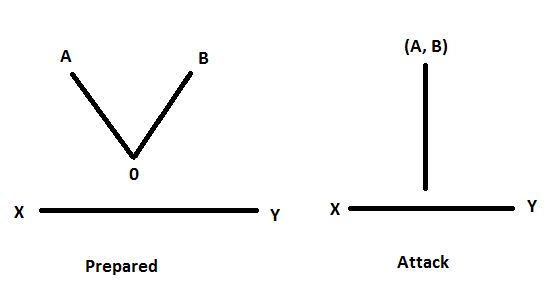 When it attack V turnes into I shape where starting point count as (0, 0) and ending point count as combination of (A, B). The length of the straight line and I shape line is the number of warriors of Pratap and Jalal. Your task is to find Who Wins the battle?? The input file contains several lines. Each line contains 4 integer numbers A, B and X, Y. All the integers are ranged to 0 to 1000. For every input the output will print “Jalal Wins” if Jalal win and “Pratap Wins” if Pratap wins. If it’s a draw print “They make friendship” in a separate line.